??????? ?2 SOS!!???? © 1991 Konami Industry Company, Limited. Wai Wai World 2 SOS!! Paseri Jou is a side scrolling action game by Konami, and sequel of Wai Wai World originally released in 1988. After the events recounted in the first episode, the land of Wai Wai was finally at peace once again. But one fateful day, the evil sorcerer War?mon appears from the shadows, steals the Parsley castle and plunges the kingdom into chaos. He kidnaps princess H?bu (aka princess Herbs) and no one stands up to stop him. No one but one person - the genius Dr Cinnamon escaped and decides to secretly build a humanoid robot boy to save the day. The Super Robot Rikkuru, as he named it, has the incredible ability to transform into several popular Konami characters, namely Goemon (Ganbare Goemon), Upa (Bio Miracle Bokutte Upa) Simon Belmont (Akumaj? Dracula), F?ma (Getsu F?ma Den) and Bill Rizer (Contra). But there is a bit of a catch. Firstly, Rikkuru must collect special items with the letter C stamped on them in order to successfully transform intro a secondary character (by jumping and pressing up at the same time). Secondly, he can only transform into three different characters that the player chooses at the start of the game (out of four teams), and he can only change into them for a mere sixty-second period. 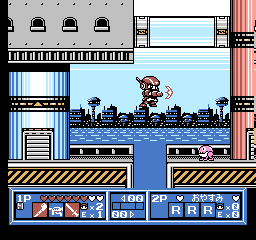 Additionally, although the Konami characters are invincible, the time limit goes down each time they receive a hit (health kits scattered around each stage allow the player to gain it all back though). Rikkuru comes equipped with a small laser blaster and the uncanny ability to double jump (thanks to his ingenious rocket boots). As expected, each character features its own weapon and characteristics, from Bill and his multi-directional machine gun to Simon and his long range whip or Upa and his magic rattle that turns enemies into floating cloud-platforms. Interestingly, all of them have the remarkable ability to charge a powerful glowing attack and kill all enemies on the screen. Wai Wai World 2 consists of nine Konami-themed levels (some of them with alternate routes) as well as various bonus stages and mini-games that switch the gameplay around, from shooting action to puzzle solving or racing. A two-simultaneous player mode is also avaible and allows a second player to take control of Blue Rikkuru and a password system is used to allow the player to return to the game at a later time. Wai Wai World 2 was released on January 05, 1991 in Japan for 6500 Yen. The subtitle of this game translates as 'SOS!! Parsley Castle'.